The Heuer portable bench vices, which Blackwoods source through Bosco Storage Solutions, weighs only 4.5Kg, yet has a grip of 10kN. Thanks to a unique Quicklaunch feature, the jaw width of the Heuer Compact portable bench vices can be adjusted from 0 to 130 mm in a couple of seconds, without extensive handle turning. The width gauge with centimeter scale helps to pre-adjust the jaws and a pressure spring facilitates safe locking in the desired position. Moreover, the parallelism of the jaws when clamping is not affected by the tolerance of the spindle. 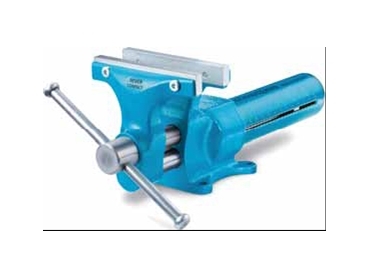 The portable bench vices’ replaceable jaws have one corrugated side and one plain side, and can be interchanged to suit applications by simply using an Allen key. In addition, the integrated pipe-gripping jaws can handle diameters up to two inches.